In this featured scientific publication, the authors illustrate that combining low-dose, high-resolution SPECT imaging with a specific tracer for cell death can provide a detailed readout of the cellular response to novel therapies and assist in the design of individualized cancer therapies. 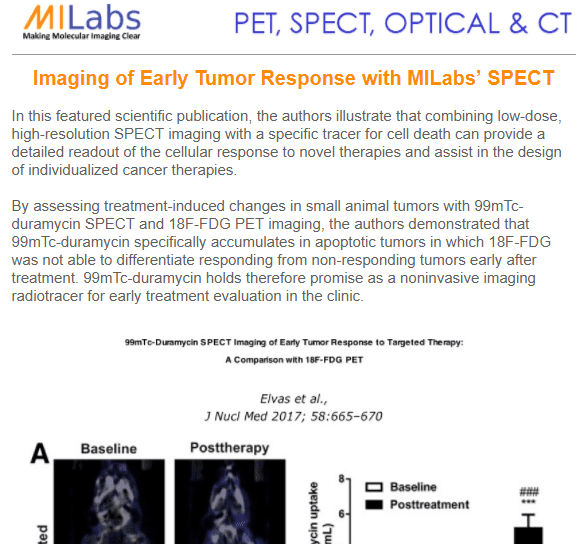 By assessing treatment-induced changes in small animal tumors with 99mTc-duramycin SPECT and 18F-FDG PET imaging, the authors demonstrated that 99mTc-duramycin specifically accumulates in apoptotic tumors in which 18F-FDG was not able to differentiate responding from non-responding tumors early after treatment. 99mTc-duramycin holds therefore promise as a noninvasive imaging radiotracer for early treatment evaluation in the clinic. Produce high-quality, statistically-robust mouse images at sub-mm resolutions. Conduct biodistribution studies to demonstrate that 99mTc-duramycin specifically accumulates in apoptotic tumors in which 18F-FDG was not able to differentiate responding from non-responding tumors early after treatment. Assess in vivo uptake quantitation and good correlation with ex vivoquantitation methods. Demonstrate that the administration of 99mTc-duramycin is safe from a dosimetry perspective and compatible with SPECT imaging in humans. Show fast blood and renal clearance and low accumulation in non-targeted organs. 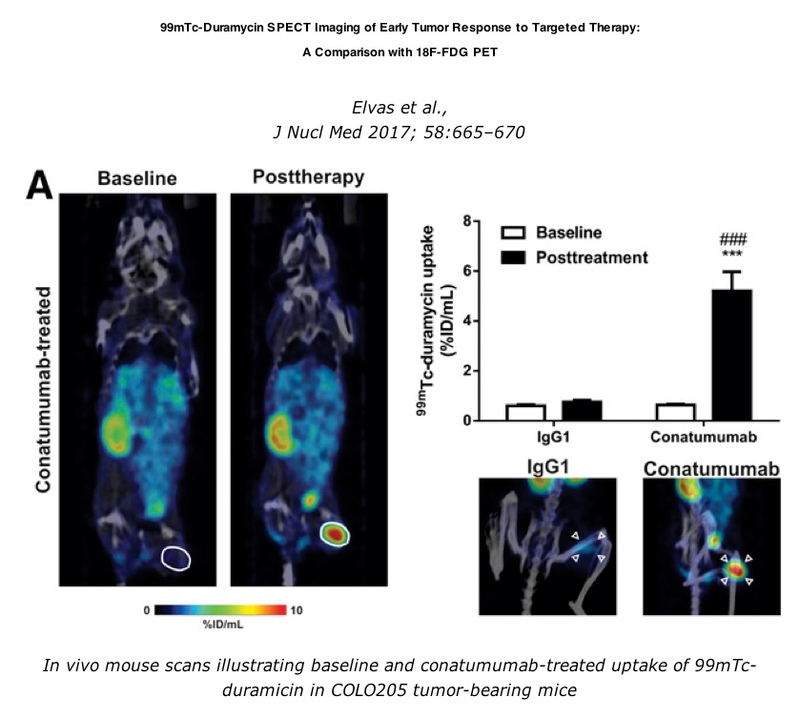 Illustrate the potential of using the Concurrent PET/SPECT/CT feature of VECTor to eventually assess in a single imaging session, the uptake of co-injected 99mTc-duramicin and 18F-FDG tracers in tumors. F. Elvas et al., Characterization of 99mTc-Duramycin as a SPECT Imaging Agent for Early Assessment of Tumor Apoptosis, Mol Imaging Biol. 2015; 17(6): 838–847. Molecular Targeting Technologies, Inc. (MTTI), Duramycin is a natural antibiotic with 19-amino acids and recognizes apoptotic and necrotic cells by binding to phosphatidyethanolamine (PE) with high affinity.